As an autistic synaesthete with dyspraxia, Patrick Jasper Lee writes and speaks about his relationship with these conditions. Diagnosed with Asperger's syndrome in 1996, Jasper expresses this unusual ability often within his art. 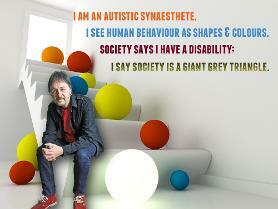 For more details on what autism, synaesthesia and dyspraxia are, please see below. Does Jasper's 'condition' hinder or help his art? Jasper's 'condition' aids his work. His sensitivity to social nuances is actually increased due to his Asperger's. This largely contradicts how others might describe people with AS. Therefore, his condition helps rather then hinders social situations. Jasper is still exploring how autism, synaesthesia and dyspraxia may combine to prove psychologically useful in helping us understand our individual characteristics, problems, skills and abilities. If you wish Jasper to talk to your group about Asperger's and synaesthesia please contact him via this website.